The hot air popcorn popper debuted in the late 1970s. It was the first time something other than hot oil was used to pop popcorn. 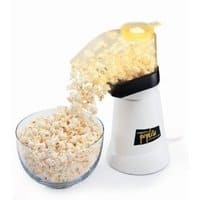 The hot air popcorn popper has a popping chamber that holds the kernels to be popped. At the bottom of this chamber is an opening, covered by a screen, where heated air is blown up through the kernels by a fan. This tosses the kernels about, but more importantly, heats them up. As a kernel heats up the moisture inside turns to steam and builds up pressure until it finally explodes to form the popcorn flake. Since the flakes are much lighter than the kernels they get blown out of the chamber and flow down an exit chute into a waiting bowl as shown in the picture. Selecting the best hot air popcorn popper was relatively easy since most were rated so poorly by their users. By far the most popular and user favorite is the PopLite Hot Air Corn Popper by Presto. You will find a detailed description of this hot air popcorn popper on the PopLite Popcorn Popper page. Presto makes another version of the PopLite branded with the Orville Redenbacher name. It's the identical popper but costs about $6.00 more. Perhaps the most advertised feature of hot air popcorn poppers is that they use hot air rather than oil to pop the corn. This makes the popcorn they product more healthy and lower calorie than popcorn made with oil. A cup of hot-air-popped popcorn has only thirty calories, which is about half of what oil-popped popcorn has. Of course if you add butter or caramel after it's popped you quickly diminish the health advantage. The fact that popcorn from a hot air popcorn popper has no oil on it can be advantageous if you plan to add some flavoring to the popcorn. You don't need to be concerned with how the flavor of the oil on the popcorn will interact with the flavoring you are going to add. In other methods of popping popcorn the popped flakes remain in the heat and humidity of the popcorn popper until the popping completes. In contrast, with a hot air popcorn popper, the popped flakes quickly exit the popping chamber and make their way to the bowl. As a result the popcorn from a hot air popcorn popper is more fluffy and dry than in the other methods. The top of most hot air popcorn poppers hold a cup that can also be used to measure how many popcorn kernels to use in the popper. It's nice that it's always there and you don't have to search for a measuring cup in your kitchen. It is very important, however, that you remember to replace the measuring cup in the lid before you turn on the popper. Since the hot air blows directly on the bottom of this measuring cup it can also be used for melting butter for your popcorn. However, this feature only works if the butter you put into the cup is soft. If you use butter taken directly from the refrigerator, it will be only partially melted by the time the popping is complete. I prefer to use the microwave to handle the butter melting process. A hot air popcorn popper is very efficient when it comes to making popcorn. Normally there are very few "old maids" (unpopped kernels) left in the popping chamber. It's not uncommon, however, for a few unpopped kernels to "jump" out of the popping chamber prior to the popcorn starting to pop. This problem can usually be mitigated by tilting the popper slightly away from the bowl until the popping commences. Since no oil is involved, the setup and cleanup of the hot air popcorn popper is very simple. The popping chamber just needs to be dumped out if there are unpopped kernels in there. The cover and butter melter can be cleaned with warm soapy water. If the butter melter is not used, just wiping the unit down with a dry cloth is all that's required. The hot air popcorn popper makes popcorn very quickly. It typically makes over 4 quarts of great popcorn in about 2 1/2 minutes. It is also well suited to making a couple batches in quick succession.